Beau's All Natural Brewing Co. Oldest craft brewer in Ontario + Canadian company renown for its knock offs = ? 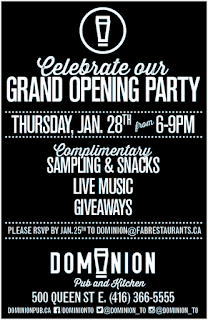 FAB Restaurant Concepts is hosting a Grand Opening Celebration for the NEW Dominion Pub & Kitchen on Thursday, January 28th 2016 from 6-9pm, located at 500 Queen St. East in the historic Dominion Hotel. The celebration will include complimentary food and beverage sampling, live music and giveaways. The restaurant space was purchased in mid-2015, and renovated with a strong appreciation and respect for Corktowns local history. 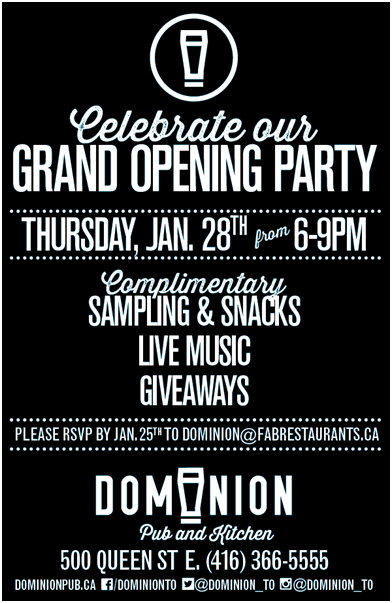 The NEW Dominion Pub & Kitchen opened in November 2015 as a contemporary pub with a focus on craft beer and unique, fresh food offerings. “Hosting a party is our way to welcome in the community and share our new pub experience with them!”, says General Manager, Charmin Kinney. “We have a vibrant space, brought to life with live music and great food and drinks”. The Grand Opening Party will include giveaways, tasting stations, live music with Same But Different (acoustic duo) and Pop Agenda. It promises to be a party you don’t want to miss!